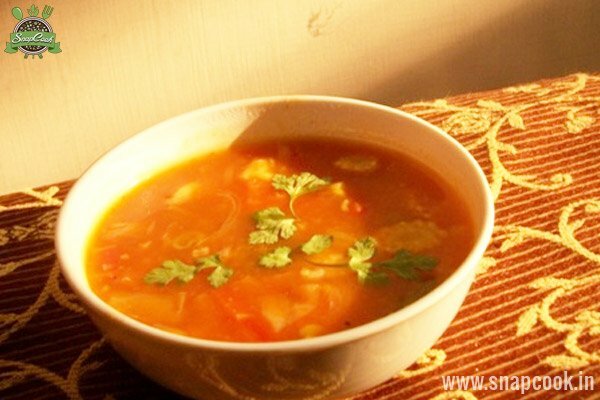 Mixed Vegetable soup is a healthy and tasty recipe of soup.In winters, it is the wonderful recipe loved by all. It is the perfect combination of sweetness and sourness which comes from tomato, sugar and pineapple juice. If you have a cold, this soup is best for you. Heat butter in a pan and fry all the chopped vegetables for few minutes. Add water in the same pan and boil it for 3-4 minutes. Heat the wok or frying pan on a high flame. Now add tomato puree in it and cook for 1-2 minutes. Add pineapple juice, vinegar, salt, sugar, pepper and vegetable stock in it. When it boils, add cornflour into it. Cook it for the required consistency. Just before serving, put the vegetables in the sauce and bring it to boil for few minutes. Add some water or vegetable stock to thin down the sauce if it is too thick.